They drill the students to respond to evolutionist’s explanations of biology with the question “How do you know?” They do so in a mocking way, hoping- I guess- that those of whom the question is asked will be as stupid as they are about the “facts” they are presenting. I’m not using the adjective “stupid” loosely in connection with them, either. Watch their response to the interviewer’s questions about how many generations of humans with 800 year old life spans could fit into a 6000 year model. Ok..it may not be stupidity. I apologize for that. It could be flat-out lying. The biblical account of Creation is not invalid; it is the best explanation available and understandable to persons of the Bronze Age about the origins of the universe. Telescopes, microscopes, the language of mathematics, and radiometric carbon-dating technologies have led to more elaborate and precise descriptions of those origins. In 4000 more years, there will be even more precise and calibrated methods of measurement available, too (if we don’t blow our own existence here away by continuing to believe God created the earth as a bottomless well of goodies for humans to luxuriate in). Those, or any, new explanatory elaborations of geology, biology, physics, and astronomy will not invalidate today’s best observations. They will have been built upon them, exactly as the things we know today were built upon the ancient observations of genuinely curious and capable persons asking “why?” and “how?” Einstein will always have a revered place in the study of physics in general, and gravity in particular, just as the cave artists of Lascoux, France- 30,000 years ago- left behind a record of their observations which is still a valid part of present day biological studies. To fear science because it might lead someone away from God is a genuine concern if one believes God must be able to be explained and understood by human minds. Personally, my understanding and appreciation and fascination with God expands with every snapshot taken from the Hubble telescope. Every time I bend over to pick up a 100 million year old ammonite fossil (of which there are millions in this area of Texas), I am struck again by the magnificence of, and my own ignorance of, God’s continuing, creating methodologies. The Bible should be regarded as wonderful and intriguing words about God. When we turn it into literal dogma, as interpreted by tour guides who choose to ignore what they can’t understand, then we are insulting both God and future generations of curious children. Wow! “Baby Bible Bashers,” produced by Firecracker Films, follows three child preachers. I’ve just watched all five Youtube segments and am depressed, angry, sad, and more committed than ever to speaking, writing, and living against this kind of foulness perpetuated in the name of Jesus. These are little children being manipulated out of a childhood by zealous adults- adults who see their children as their own redemption from failure or- in the case of one daddy- an eternal meal ticket, along with the cars and homes appropriate to being the father of an empire-building “little man of God.” The kids have much more to say about hell than love, perhaps because that is what they know best. Young Samuel, forced onto the streets of New York City while his daddy taunts homosexuals, is simply a heart-breaking figure. His parents have made him so afraid of “long worms in hell” that he must fight to be a little boy. And that, of course, is deemed to be rebellious and disobedient, which will no doubt earn him yet another spanking. It’s nebulous, for sure. And so easily manipulated for the 30-second sound bite crowd by the peddlers of fear. Listen to whole sermon, and see if you can’t hear a lot of it. Ready for a little more now? Try this next one. If you choose to miss what Rev. Wright is saying here, go back to Sean Hannity on Fox News, he’ll tell you what you want to know. But if your ears are open, even if you disagree with what he says about George W. Bush (and you might, that’s OK), you’ll hear a perspective on the Bible that we must all hear. For those with open ears, open eyes, and open hearts, the bleeding wounds of racism in America are evident everyday- every hour and every minute for many. It is a complex, jagged, and deep wound which, because of neglect or intentional denial, has spread throughout the entire body of our country, and has been bending us for so long that few of us recognize the extent of deformation it has caused not only in our corporate body and mind, but within our American soul. I am racist. I say that in the same way that I am honest about the fact that I have arthritis, or that I want- at some point everyday- to salve my ravenous emotions with the balm of Jim Beam. Those are just facts, realities about myself with which I must live and compensate for with the best of my awareness and abilities. I don’t know specifically where and when arthritis first began to grip my spine; nor do I know when the diseased defaults to racist attitudes began that I still am so easily able to display from time to time. Both of those things (along with the continuing desire- after fifteen years of abstinence- for an alcoholic fog to soften the day) are infestations I had no control over at the time they entered my being. I’ve managed all of them, to an extent. I intentionally do not not drink and do what I can, with others, to keep Jim Beam and his sidekick, Bud, at bay. I swallow pills daily to keep my over-active anti-inflammatory systems in check. Racism, however, is probably the most difficult infection to deal with because of the daily reinforcements and affirmations that pour onto it, like gasoline on a fire. It flares at times, it sizzles often, and is always a (usually benign) ember that burns within me. I don’t want it to be there. It is much, much smaller than it once was. And if I try to justify its presence based on a comparison of it to the hot coal which burns in others then, indeed, it was never very large. But it is there, and I hate that it is there. I want it gone. I know the hope for its complete eradication is still generations away, for myself (i.e., my children and their children) and my country. I am not able to say I will die one day with nothing but a cold ash of racism within me. But I do hope, and will act on the possibilities of seeing that hope manifested as soon as possible in all the ways I can, whenever I can, wherever and however I can. My children are already less burdened (not only because of me, by any means!) of my various afflictions than I will ever be, thank God. And I do thank God for that, and a whole long and glorious line of my fellow Americans who have been courageous enough to reveal the wounds of racism to be no mere reality which are harmful to some, but that are crippling, festering, killing wounds that are endemic to all of us. The blessing of being 58 years old in America is to have been alive in the same place, breathing the same air, as some of these past and present healers. Two of them, of course, as they have been, are, and will be for so many Americans (and wounded people everywhere) are Martin Luther King, Jr., and Malcolm X. In fact, the first piece of American literature that I would recommend to anyone- even above The Adventures of Huckleberry Finn and Grapes of Wrath– is King’s Letter from a Birmingham Jail. Soon after that, I would urge anyone to read The Autobiography of Malcolm X, by Alex Haley. Many people my age or older will remember Malcolm X in the fiery contexts of the early 60s, a time of frightening cultural change. Read him again, in the light of the forty years of history we have lived through since his death, and you will find yourself mourning his murder. As of yesterday- and, yes, it is the reason I’m writing all of this in the first place- we heard a a speech by Senator Obama that may one day find itself in the same heady categories as the two pieces of literature mentioned above. Because of his unique cultural stance, he was able to elaborate on racism in America in a way that no one before him has personally been able to do. In black and white, African and American terms, his genetic voice and his intellectual honesty and wisdom have provided content for years of discussion and action and- most importantly- real social and soulful change. Whether a person is a supporter of his candidacy for president or not, this speech deserves to be read, studied, and pondered. In fact, I would urge those who are most opposed to that candidacy to read it most contemplatively. And I say that not because it might change your vote, but because it might change you. I’ve overheard too many conversations about why someone is a Clinton or McCain supporter to not also have heard heart-breakingly racist statements being made in the guise of political or ideological language. Not all of those supportive statements for other candidates are racist, by any means, but enough are for anyone to know, if their eyes, ears, and hearts are open, that the blood and pus of racist wounds are still running fresh. Read Senator Obama’s speech here. We talked about this step last night at a meeting. Step 10 speaks of the necessity for the recovering addict (or anyone for that matter) to periodically step back from themselves, and examine which of the old habits, ideas, or self-misunderstandings which got them into trouble in the first place, may be re-forming themselves. Which of those old, easily-defaulted-to behaviors or thoughts might be ready to reach out and grab whatever weak link in one’s recovery might be revealing itself anew? It’s a good thing, obviously, to know about, and a group of like-minded others can help one to more ably do that. Some of us were remembering incidents in which we were confronted by someone or something outside ourselves in a way that was self-revealing, sometimes jarringly so. I remembered two pieces of art, both seen when I was only 17-18 years old, that did that for me in a way that I can still remember. Michaelangelo’s Pieta, and Picasso’s Guernica shook my understandings of how the world might be perceived in ways that I had not known it was possible to perceive the world. They were both doors of discovery that I could not stop myself from entering, nor that I could make practical sense of once I had entered. I saw this in the Vatican with a tour group in 1967. I was one of a few teenagers in a group of adult construction company owners and their wives who had gotten free trips to Europe for buying backhoes from a particular implement dealer in Ohio. 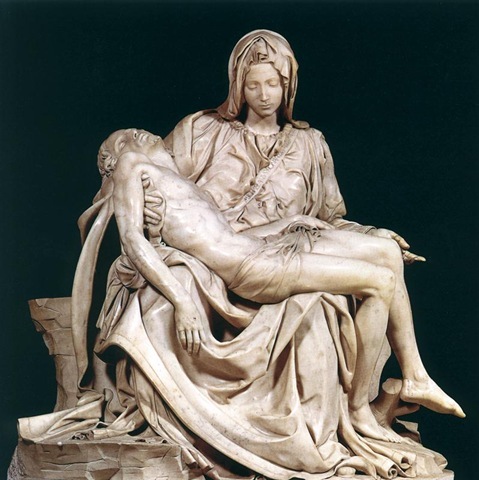 Since 1972, the Pieta has been on display behind bullet-proof glass and must be viewed from twenty feet away, because of a hammer attack that year by a crazed man, Laszlo Toth. But in 1967, there was no protective glass, and the Pieta was there- ten feet in front of us. I saw it and forgot who I was. It was not a spiritual experience in the sense that I was overwhelmed by Mary’s sorrow or Jesus’ death. It was an experience of encountering Beauty in a form I had not known was possible. This was marble, caressed into fingernails and upper lips. This was rock, tapped gently into folds of cloth, and pressed-upon skin. This was cold stone, fashioned into eyes brimming with tears, freshly pierced wounds, and pulsing veins. It was a personal inventory that was forced upon me- a realization of something about myself that I have never (thank God) stopped getting used to. I learned that it is not the tour group that needs kept up with, it is what I am seeing and experiencing, right here and right now, that is the most important thing. It’s taken me all of the forty years since then to put that revelation into words, and I could regret those decades of inarticulation. Instead, I choose to be thankful for finally being able to understand why, in retrospect, I always felt apart from the crowd up ahead, and wanting- all the time- to know more, more, more about (it seems) everything I ever saw that reminded me of the way Michalengelo was able to make marble sing. Cooties- It’s worse than you think! I had them when I was a child; maybe you did, too. I’ve always felt too ashamed to admit it publicly, but now I must.